On July 26, 1942 at 10:00am, departed Kataoka Bay on Shumushu Island. On July 28, 1942 arrived Holtz Bay on Attu Island at 02:00 and unloading commenced. The vessel departed at 12:00 with only 5 passengers aboard bound for Kiska Island. On July 30, 1942 at 0800 at a point 36 km north of Kiska, the ship ran into dense fog and slowed down from 15 knots then drifted. Presumably, submarine USS Grunion SS-216 spotted Kano Maru and made at least four torpedo attacks. On July 31, 1942 at 5:47am, a torpedo hit the ship's starboard engine room and causing the loss of electric power and communications. At 5:57am, two more torpedoes passed under ship but failed to detonate. A third attack was made at 6:07am and a fourth attack on the port side of the ship scored a direct hit below the bridge, but the torpedo failed to explode. Kano Maru opened fire with her 8cm deck gun and is believed to have damaged or sunk the attacking submarine. Kikukawa Maru towed the damaged ship to Kiska Bay arriving at midnight on August 1 and immediately, unloading began. A total of 1,000 cubic metres of general cargo, four Daihatsu landing barges, clothing and all coal was removed. During this period, the damaged vessel served as an artificial harbor and the shoreline nearby was used as harbor for Daihatsu / and Shohatsu barges. On September 15, 1942 Kano Maru was attacked by aircraft. A near miss on the port side further damaged the hull and the vessel began sinking and ran aground. 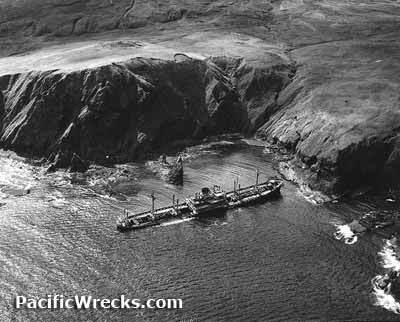 Strong winds and seas caused it to ground again near South Head where it was wrecked and salvage or repair were impossible and was abandoned.